Biomass gasification refers to a process which involves burning of biomass for the generation of producer gas or syngas. Producer gas is a combustible gas mixture of carbon monoxide, hydrogen, carbon dioxide, methane and nitrogen. The gasification process uses heat, pressure and partial combustion which takes place when the air supply (O2) is inadequate for the combustion of biomass. The status of gasification at the country level generally depends on the background of industry and energy production in the country. For instance, it is mostly used in countries with widespread forest or pulp and paper industry along with amply indigenous biomass. Although biomass holds a small share in the global electricity production, its use is growing significantly faster than a number of other energy sources. 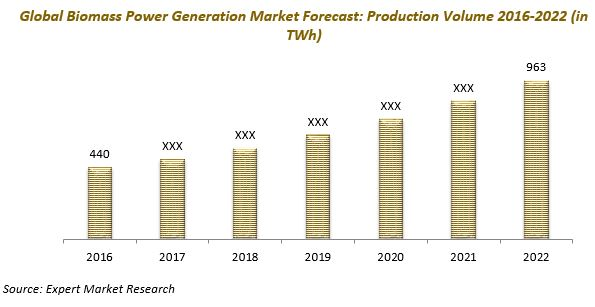 According to a new report by Expert Market Research, the global biomass power generation market reached a production volume of 614 TWh in 2018 and is further expected to reach 1137 TWh by 2024. The market growth can be accredited to a number of factors. It is a renewable raw material which creates no harmful carbon dioxide emissions and helps in waste management. This is one of the primary factors driving the demand for biomass gasification. Moreover, on account of increasing environmental concerns and rising green-house gas emissions, countries are now shifting towards eco-friendly energy sources. Government’s support through various policies and regulations along with abundant availability of biomass have also acted as a catalyst for the market growth. Different sources of biomass electricity production are solid biomass, biogas, municipal waste and liquid biomass. Among these, solid biomass represented the biggest source of biomass electricity production in 2018. Various end-use sectors of biomass electricity are industrial, transportation and other sectors. Region-wise, Europe represented the largest market for biomass electricity production with a share of more than a third of the market. Other major regions include North America, Asia-Pacific and South America. Some of the top players operating in the market are Vaskiluodon Voima, Lahti Energia, Essent, Electrabel, Sodra Cell Varo Pulp Mill, Rudorsdorfer Zement, Agnion Technologies, Corenso United, Skive Fiernvarme and Babcock and Wilcox Volund.